Both of our boys have (thankfully) been amazing sleepers and I really credit that to our very consistent bedtime routine. No matter where we are or what time it is, we always go through the same steps as well as we can, and we have found that it really helps the boys take time to settle in and get a good night’s sleep. When we’re home, our evening routine always starts after dinner with bath time. We used to be able to do “brother bath” and get both boys clean at the same time but they’re starting to take up too much space in the tub and I end up soaked from all of the splashing they encourage each other to do. 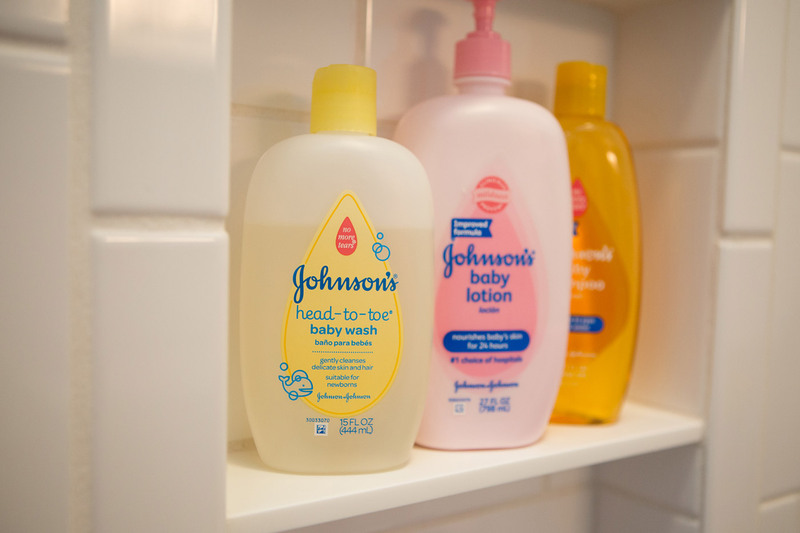 For bath time, we’ve been pretty consistent with the same products over the years and have relied on JOHNSON’S® baby products for both Jackson and Dylan. At bedtime, I especially like their BEDTIME® Baby Wash and BEDTIME®Baby Lotion, and I’ll also use the JOHNSON’S® Baby Shampoo. I love how all of the products smell and feel, they’re just so quintessentially and perfectly “baby.” I also really appreciate the NO MORE TEARS® formula, especially since there’s a heavy amount of splashing and bubbling going on at our bath time. Fast-forward to a few weeks later and we were watching Sesame Street, Dylan’s new obsession, and low and behold Elmo took a bubble bath. Later in the day we were getting to that same “I didn’t take a nap and now I’m tired and cranky” time and started running out of options to keep him entertained till bedtime rolled around. A light bulb went off in my head and I asked him “Dylan do you want to take a bubble bath like Elmo?” He stopped in his tracks, looked at me and said “Upstairs me. Tub. I bubble.” Translation: “Yes, I would like a bubble bath. Let’s go upstairs! Turns out, the fear of bubbles is gone and bubble baths are now the best thing he’s ever done. Anyway, after bath, we settle in for books. We’re big readers around here and have been reading to both boys consistently and frequently since they were babies. They both really seem to love their books and are always asking for more, which we’re so proud of and happy about. Jackson started reading well when he was 4 and now at almost 6 is way ahead of the game on the type and level of books that he’s reading. My hope is that Dylan follows close behind. 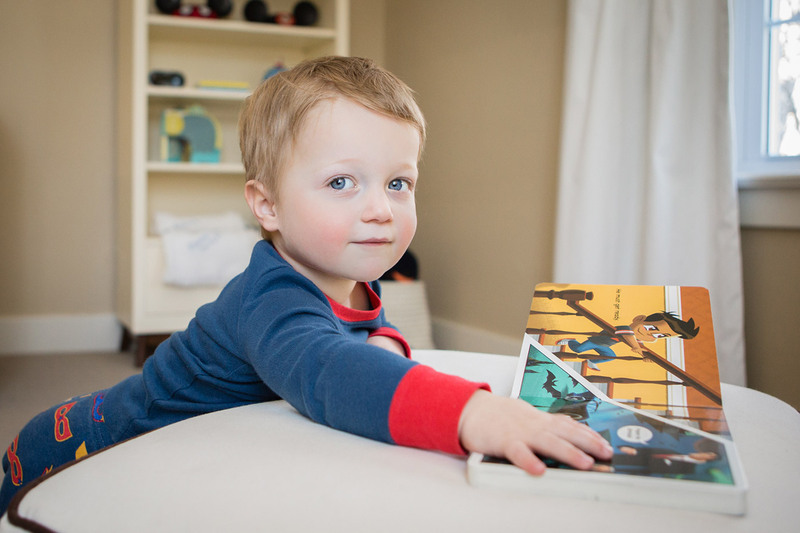 Lately some of our favorite bedtime books for Dylan have been Goodnight Goodnight Construction Site, Bedtime for Batman (this series is super cute and there are Wonder Woman and Superman versions too), Close Your Eyes and Steam Train Dream Train. Then it is lights out and a little bit of quiet time with some songs and the white noise machine playing in the background before Dylan get put in his crib and settles in for the night. I always watch him on the monitor and he plays for a little bit, checks out the character on his PJs and then finally falls asleep. His big brother used to go to bed at 7:00 and wake up at 10:00 am the next day consistently and that was AMAZING. Dylan usually goes to bed by 7 and is up around 7, as well. I hear that’s pretty darn good and we’ll take it! So that’s how things go around here at nighttime. 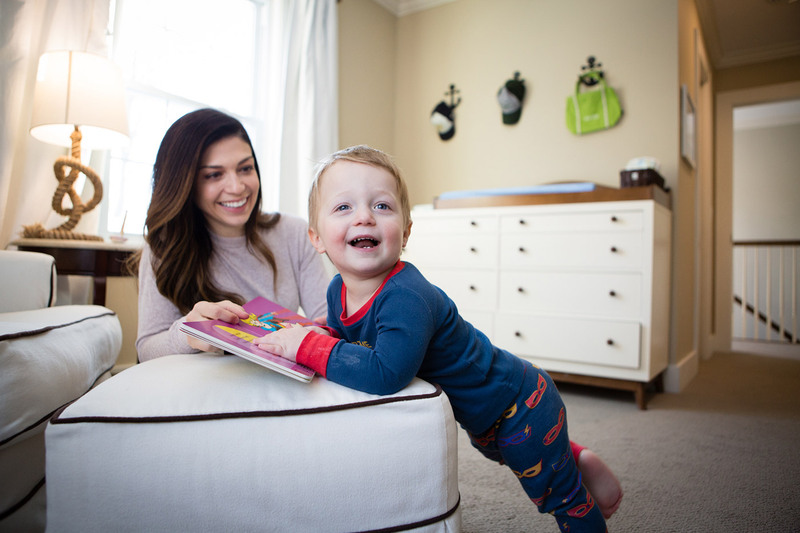 What are some of your favorite parts of your family nighttime routine?